← 2014 is coming! Are we ready for it? 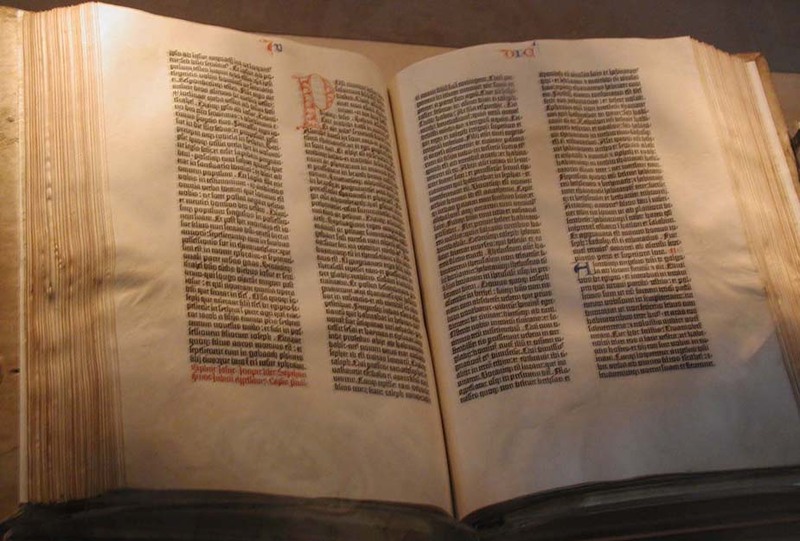 A Gutenberg Bible. Probably not the most practical version for reading. Credit: Mark Pellegrini. I have read every part of the Bible at least twice and probably a majority of it three times. But one thing I have not done is to read the whole thing cover to cover in order. So I decided that I would do that in 2014. However, I was not satisfied with the various reading plans that are available, so I decided to write my own, which I am now sharing here. After all, whether you’re a believer or not, reading through the Bible is at the very least a valuable cultural exercise. In my close reading of the Bible over the past several years, I began to notice the importance of the larger narrative structure within books and even, to some extent, across books, which is easily missed in the way that we typically read the Bible. Reading short passages in church or single chapters in Bible studies are valuable modes of study, but they break apart the longer narratives that are intended to be read as a unit, for example, the story of the Flood, which stretches across four chapters. Unfortunately, many reading plans that cover the Bible in one year do not take the narrative structure into account. The organization varies, with some plans being topical and some being chronological, but even those that run cover to cover often do little better than blindly dividing the text into three chapters a day. Followed strictly, this would put a break in the middle of the Flood narrative, which I feel is the wrong way to read it. Therefore, in my reading plan, I took the narrative structure into consideration, which I consider to be at least the more logical way to read it, and in some cases is very likely the original intent. For example, Paul’s letters were each intended to be read in a single sitting, something that I have preserved, except for the longest ones. And the cover-to-cover organization is, indeed, important because that is the natural and traditional way to read the Bible since it was compiled, and it keeps all of the books in one piece. I had two considerations in writing the plan. The first was to honor the layout of the text by keeping coherent narratives intact to the best of my ability. This often resulted in readings of very different lengths, with anywhere from one chapter to seven (Micah) eight (Songs of Songs) and in the case of the shortest Psalms, twelve. The second consideration was to try to equalize the lengths of the readings based on the actual word count of each book. Since the lengths of chapters and verses can vary widely, simply dividing the text into sections of three chapters would result in very different lengths of readings by itself. Looking at the word counts allowed me to mitigate this issue by combining or breaking up the readings, at least where there is enough flexibility in the narrative. As a result, the shortest reading is 3 John, at 300 words, while the longest is probably all of Lamentations at 3400 words, which is only about one and a half times the average length. I have also endeavored to make the readings consist mostly of whole chapters, but this is not always possible. For example, all of the clearly written breaks in the action in Mark occur in the middle of a chapter. For clarification, whenever a single number is written instead of chapter and verse, it always refers to a whole chapter. This entry was posted in Reading, Religion and tagged 2014, bible, bible in a year, reading plan. Bookmark the permalink.